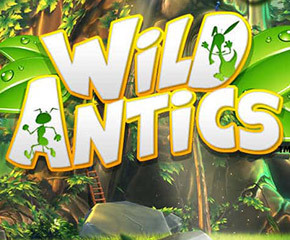 Wild Antics slots is a new amazing online game developed by world gaming leader i.e. Blueprint Gaming. It has a very cartoonish-like theme and is going to be loved by the cartoon lovers and is based on the life of a colony of ants living in the Suburban gardens. The players can place a maximum bet of £500.00 per spin and a minimum bet of £0.20 per spin. The players can squeeze a maximum jackpot of 500× of their stake. Wild Antics slots are built with 5 reels along with 3 rows and 20 active fixed pay lines. Moreover, at the backdrop of reels, the players will see a scenario of a forest-like world which is bulked with big trees trunks surrounded by the green grass all over them. This slot game has very well crafted symbols and high symbols are recognised as- the Snail, the Blue Ant, the Wild Antics icon and the Lady Bird; whereas the playing cards form the part of lower symbols. The Sunflower is the wild symbol of this Wild Antics slot game. In order to form a winning combination, this symbol will replace all symbols other than for 5 bonus icons. This slot has 5 bonus symbols which can be recognised as- Colonel Ant, Soldier Ant, the Aardvark, Queen Ant, and Worker Ant. When the Roaming Wilds bonus symbol appears on reels 1 and 3 they will trigger the free spins round. After which, the players will view the ‘roaming’ wilds moving all over the screen. However, all roaming wilds will appear only on reel 5 only. During free spins round, the Jet Pack Ants will reactivate any bonus feature. Aardvark Antics- Under this feature, the random reels will turn wild, and may result in activation of 40 more paylines. Frantic Antics- Under this, the symbols get rearranged in compliance with winning combinations. Colossal Antics- Under this, the Colossal wilds gets summed up to the reels. 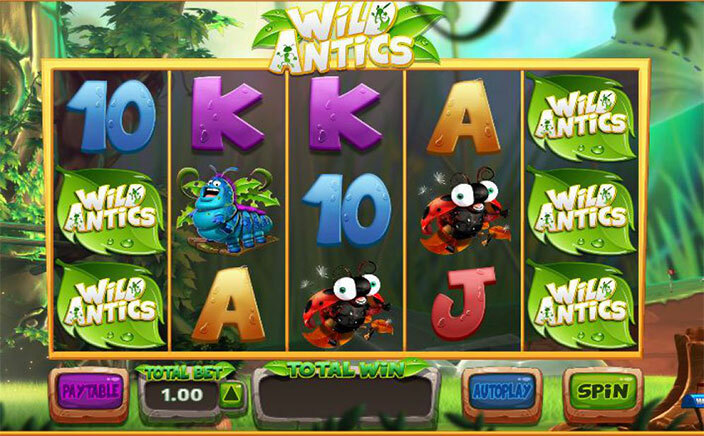 Wild Antics- This feature will turn the positions of the random reel into the wild and may result in the big wins. This is one of the finest slot developed by Blueprint Gaming. The slot has very exciting bonus features which make it more lucrative. The slot has a moderate variance and one can earn a hefty amount by playing it cleverly. It has a return to player percentage approximately of 95-97%.